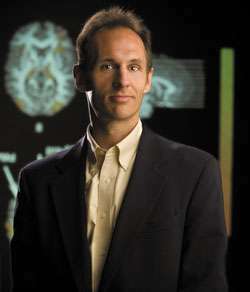 Grasping an object involves a complex network of brain functions. First, visual cues are processed in specialized areas of the brain. Then, other areas of the brain use these signals to control the hands to reach for and manipulate the desired object. New findings from researchers at the University of Missouri suggest that the cerebellum, a region of the brain that has changed very little over time, may play a critical role. Findings could lead to advancements in assistive technologies benefiting the disabled. "We live in a world of advanced technology in which a button can move a crane or open a door," said Scott Frey, professor of psychological sciences in the College of Arts and Science and director of the Brain Imaging Center at MU. "For those with disabilities, assistive technologies, such as robotic arms or sensors inserted in the brain, make it possible to accomplish actions like grasping with the press of a button or directly through brain activity; however, little is known about how the human brain adapts to these technologies. We found that the brain didn't necessarily evolve to control modern robotic arms, but rather the cerebellum, an ancient portion of our brain that has remained relatively unchanged, plays a vital role in helping us reach and grasp with these tools—often with only minimal training." The study, "Grasping with the press of a button: grasp-selective responses in the human anterior intraparietal sulcus depend on nonarbitrary causal relationships between hand movements and end-effector actions," was recently published in the Journal of Cognitive Neuroscience.